The rate of dissolution for a specific drug is determined by its release kinetics and diffusion coefficient. 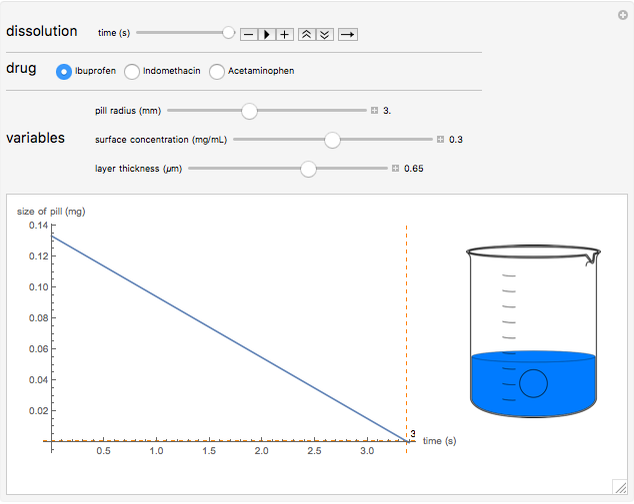 This Demonstration considers three drugs in everyday use, modeled by a tablet dissolving in a beaker of water. This provides an indication of the pharmacological response to a drug in systemic circulation. S. M. Upadrashta, B. O. Häglund and L.-O. Sundelöf, "Diffusion and Concentration Profiles of Drugs in Gels," Journal of Pharmaceutical Sciences, 82(11), 1993 pp. 1094–1098. doi:10.1002/jps.2600821106. Megan Mitchell and John Yoon "Dissolution of Common Medications as Modeled by Drug Release Kinetics"